WillingToBeLucky.net: Take The Black - A Game of Thrones Fan Event Celebrating the Release of Season 2 on Blu-Ray and DVD!!! 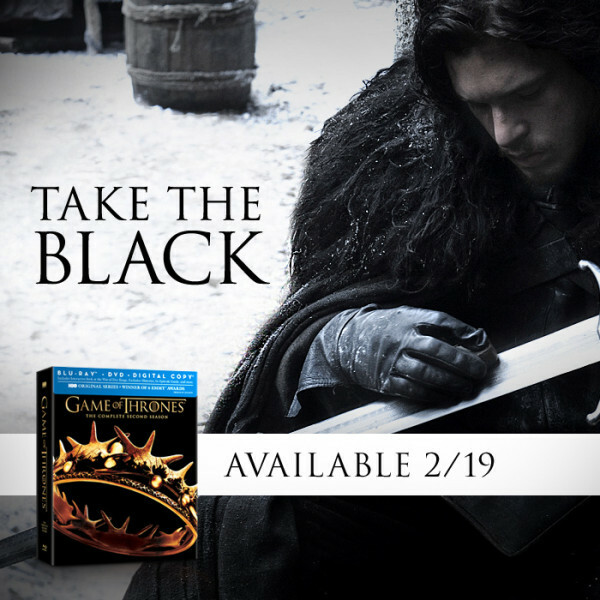 Take The Black - A Game of Thrones Fan Event Celebrating the Release of Season 2 on Blu-Ray and DVD!!! Fellow MikeTheFanboy.com writer, Erica came to visit this weekend. We’re both huge Game of Thrones fans so when we heard that there would be a season two Blu-Ray/DVD launch at the Best Buy Union Square. So we headed to the Take The Black fan event! We journeyed to Union Square. They began handing out the wristbands at around 5:45 and the wait began. We were corralled into a pen they’d set up for the event. On one side, they had an area blocked off for the life-size Direwolf Ice Sculpture and beyond that, a tent for the food! 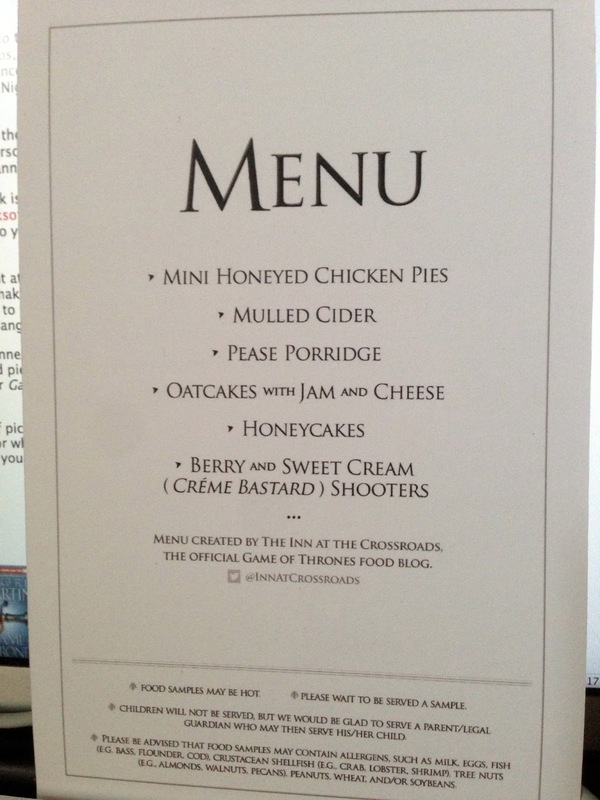 At around 7, we were taken upstairs to record us reciting the Night’s Watch Oath. I looked awesome in my bright pink...D’oh! At the top of escalators, they had Kit Harrington’s full Night’s Watch costume as well as Longclaw, Jon Snow’s sword. Very cool! We heading back downstairs where we were given some DELICIOUS food from Inn at the Crossroads. I can’t lie, I went back for seconds, I would’ve gone back for more if I wasn’t so full! Up next, they began carving the Direwolf. We had a front row view to the whole thing and it was really cool to watch. It started out looking like a bear-pig hybrid and ended up looking very much like a Direwolf! Meanwhile, over near the other side of the line, musician Jason Yang and a few others played some great selections from the Game of Thrones soundtrack. If you don’t remember, Jason is the one who played the BEAUTIFUL violin cover of the theme song. It definitely set the mood! As 11 o’clock approached, they began to take us inside where we’d received the goody bags and a scroll that would tell us if we won one of the many prizes - A Ulysse Nardin “Night’s Watch” limited edition marine diver watch, an Iron Throne Replica Statue, a Dragon Egg Necklace and more! Neither of us won but we were quite happy with our sigil scarves; I got Lannister! We waited in another line, this time to finally purchase our Blu-Rays! 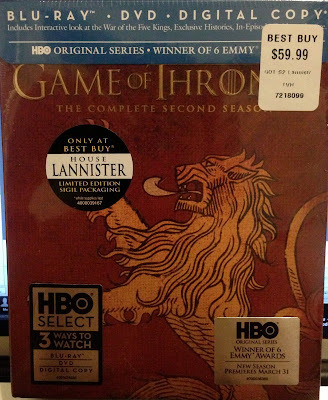 I ended up getting the House Lannister Limited Edition Packaging! To top the fantastic evening off, as we headed uptown on the subway, we noticed that Mance Rayder himself happened to be at the station! Mr. Ciarán Hinds was kind enough to indulge us and we were able to get photos! What an incredible man! We ended up on the same train and can now say we rode North with Mance Rayder. Wonderful way to end a wonderful evening!!! Don't forget to go out and buy your copy of season 2 of Game of Thrones available now!! !